In Park City, Utah on March 24, 2018, a group of young protesters performed “Seasons of Love,” from the 1996 Broadway musical Rent. “525,600 minutes,” they sang, “How do you measure a year?” 2018 has, in its three months to date, cast an unusual focus on measurements of time. In January, the President gave a nearly record-breaking State of the Union address, 81 minutes long. His perpetually at-risk White House staffers have continued to clock some of the shortest tenures in U.S history. Then, in February, six minutes and 20 seconds of gunfire in Parkland, Florida left seventeen dead, leading to a seventeen-minute national school walkout in March, with the widespread observation of seventeen minutes, one minute, or even seventeen seconds of silence 3,000 times over, across the nation’s six time zones. During the March 14 school walkouts, students from Central High School in Columbus, Georgia premiered their original song, “The Separation.” The lyrics asked, “Do we have a voice?” The answer to that question—given by thousands of young Americans on that day and during the subsequent #MarchForOurLives events—is a resounding yes. But amid the impassioned speeches, chanting, slam poetry, and song, it was the moments in which their voices fell silent that had perhaps the greatest impact. This movement is all about voice and silence. Most modern social movements have been predicated on metaphorical understandings of voice that position it as both a site and as an act of agency.<1> The current protests present a doubly agentive framework of voice, acknowledging the ever-mounting numbers of vanished voices silenced in gunfire, and the living voices that bear the burden of speech, of speaking, for them. In D.C., a treble choir from Amherst, Massachusetts sang “I can’t keep quiet,” repeating the unofficial anthem (Balingit 2017) of the January 2017 Women’s March.<2> And though the pressure of the day made Parkland survivor Sam Fuentes sick in the middle of her speech (“on international television,” she ruefully exclaimed), rather than put the burden down, she not only continued speaking, but then sang to honor her slain friend Nicholas Dworet on his birthday. A protest sign, captured in an online listicle, read, “YOU CAN PUT A SILENCER ON A [image of a military-style assault rifle] BUT NOT ON OUR VOICES” (Isaac 2018). Young leaders of the rallies have attended to the question of whose voices will be heard, and have striven toward equity (Hamedy 2018). They have also considered who will have access to those voices, and included virtual march participation and ASL interpreters. In addition to lifting silenced voices, students are protesting the persistence of silences where voices should be speaking—the prolonged legislative silence that has allowed school shootings to continue, the silence surrounding the financial involvement of the NRA in U.S. political structure, the silence of the nation when the victims aren’t white, or when the terrorists are. If those in power won’t speak, the students will fill that silence with their voices. They are also combating the silence implicit in speech that only offers empty words—the “thoughts and prayers” that lawmakers tweet after each set of murders—with their own silences, full of meaning. On March 14, hundreds of students lining Pennsylvania Avenue in Washington, D.C. suddenly hushed and turned their backs on the White House. 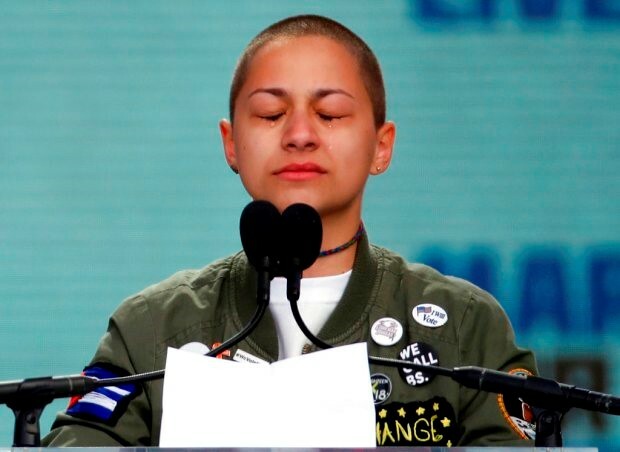 And the terror and grief of Parkland’s six minutes and 20 seconds of violence were amplified last Saturday in the powerful minutes of silence performed by survivor Emma González—a silence that was anything but still, and that penetrated the sanctuary of American living rooms as sharply as the sound of bullets had pierced the halls at Marjory Stoneman Douglas High School. It will, I think, echo for generations. The Nation predicts that it could “Change the World” (Walsh 2018). Musicology Now editor Susan Thomas, in conversation with me this week, aptly compared González’ six minutes and 20 seconds in D.C. to John Cage’s experimental 4’33.” The silence, framed within the speech, did, similarly, effectively reshape its audience’s experience of political oratory. Punctuated by shouts of support, brief bursts of applause, and the miked rasp of González’ unsteady, determined breathing, it was a challenge to all listeners, especially to lawmakers, to rethink the structural intersections of political noise and political silence. As the seconds ticked by, the message to the American establishment was loud and clear. The silence succinctly summarized everything that González and David Hogg and Edna Lisbeth Chávez and 11-year-old Naomi Wadler and 9-year-old Yolanda Renee King had said out loud. It said, “Enough is Enough.” It said, “Vote them out!” It said, “La lucha sigue.” And though a digital timer abruptly sounded the end of González’ 6’20”, the silence itself was the real alarm. Echoing the year’s very first hashtag social movement (Buckley 2018), it told abusers of power: time’s up. It’s important to remember that our new national heroes may be, as one declared, “magic,” but they are not junior wizards whose destiny it is to definitively defeat evil. Neither are they just children singing sentimental songs. They are young people who have watched their friends die, and endured the kind of bodily injury and emotional trauma that belong to war. They are young people whose lives and education have been, at the very minimum, disrupted multiple times each year by active-shooter drills and actual lockdowns, who in their communities have “learned to duck from a bullet before [they] learned how to read.” They have been taught to hide in closets, taught strategies to mitigate the certain casualties their peer groups will face if a gunman enters their school, taught to throw books, barricade doors, to try and save each other. That’s what they’re doing now, in using and withholding their voices—saving each other. Another national school walkout is planned for April 20, the anniversary of the Columbine shooting in 1999. And whether it’s to a nationwide teenage silent treatment or a chorus of changing voices, Americans should be listening. <1>Including the Deaf identity movement, which from its earliest days has had to negotiate and interrogate this metaphor in the face of centuries of voice-based persecution. <2>This information, along with a video of the March 24 performance, was posted to the Pantsuit Nation Facebook group on March 25. However, the post is not shareable publicly. The song “Quiet” was written by MILCK, the stage name of Los Angeles-based artist Connie K. Lim, and performed with members of three a cappella groups during the Women’s March in Washington, D.C., on January 21, 2017. The singers were recorded by a documentary filmmaker and the YouTube video had collected millions of views by the following day. MILCK has set up a website to make the song freely available to those wishing to use it in public protest gatherings. Balingit, Moriah. 2017. “’I Can’t Keep Quiet’: Watch This Stirring Performance of What So Call the Women’s March Anthem.” January 24. < https://www.washingtonpost.com/news/inspired-life/wp/2017/01/24/i-cant-keep-quiet-watch-this-stirring-performance-of-what-some-call-the-womens-march-anthem/?utm_term=.32a2a5fdb7f4> (accessed March 25, 2018). Buckley, Cara. 2018. “Powerful Hollywood Women Unveil Anti-Harassment Action Plan.” NYTimes.com. January 1. < https://www.nytimes.com/2018/01/01/movies/times-up-hollywood-women-sexual-harassment.html> (accessed March 25, 2018). Hamedy, Saba. 2018. “The Parkland Kids Keep Checking Their Privilege.” Cnn.com. March 25. < https://www.cnn.com/2018/03/24/politics/march-for-our-lives-students-checking-privilege-trnd/index.html> (accessed March 26, 2018). Isaac, Bronwyn. 2018. “30 Signs From Today’s March For Our Lives that Will Give You Chills.” SomeECards.com. March 24. < https://www.someecards.com/news/news/signs-march-for-our-lives/> (accessed March 25, 2018). Walsh, Joan. 2018. “6 Minutes and 20 Seconds that Could Change the World.” TheNation.com. March 24. < https://www.thenation.com/article/6-minutes-and-20-seconds-that-could-change-the-world/> (accessed March 26, 2018). Great post. Thanks! Could you say more about your archive? Your list of links is wonderful, although given the nature of online content (esp. social media) I think a lot of this might not be available in the future.